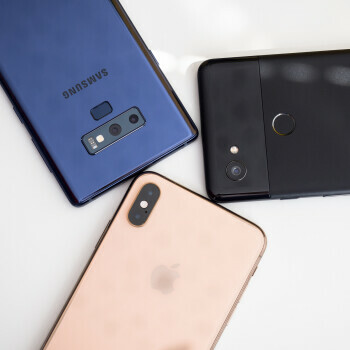 When it comes to smartphone cameras, iPhones have traditionally been close to the top of the class, if not on the very top, according to some. 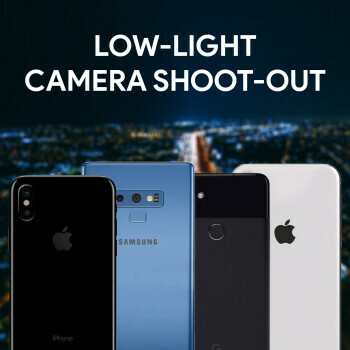 In recent years, however, as low-light performance became increasingly important in smartphone photography, iPhones have had some troubles keeping up with the competition. Even the iPhone X, which is otherwise capable of pulling off some stunning shots when there's enough light, didn't quite manage to stun me with its low-light performance when I put it to the test against the Galaxy S9, the Huawei P20 Pro and the Pixel 2 XL. With the iPhone XS, however, things have changed. The latest iPhone model demonstrates a marked improvement over its predecessor, not only thanks to its bigger camera sensor, but thanks to the new software as well. We've already seen the iPhone XS pull off some pretty amazing daytime shots and demonstrate vastly improved dynamic range over the iPhone X, thanks to the new Smart HDR mode, but how does it fare after dark? Is it better than the iPhone X, and if yes, is this enough for it to stand its own against some of the other top smartphone cameras on the market? Let's put the iPhone XS to the test against the Samsung Galaxy Note 9, the Google Pixel 2 XL, and the iPhone X. As is usual with these types of comparisons, we are beginning just after sunset, during the so-called blue hour. At this time of day, there is still some light lef in the sky, but street lights are usually already on and there's just 15 to 20 short minutes left until the dark, evening sky sets in. Under these circumstances, all four phones do a commendable job at rendering the scene. The iPhone XS demonstrates superior sharpness to the iPhone X, and is pretty much on par with the Pixel 2 XL. The Galaxy Note 9, however, produces the clearest, sharpest result of the bunch. When it comes to color rendering, the iPhone XS and the iPhone X are very similar, though the latter produces a higher contrast image in this scene. Both iPhone models are surprisingly accurate in this scenario. The Galaxy Note 9 and the Pixel 2 XL don't do as good of a job at capturing the ambiance of the scene, as both subdue the warm glow of the lights rather aggressively. This likely happens in an attempt to "correct" the white balance of the scene, though in this case, the attempt is unsuccessful. This holds especially true for the Pixel 2 XL, which produces an image with a very strong blue tint. This scene gives us a better idea as to how the four phones handle bright, direct light sources. 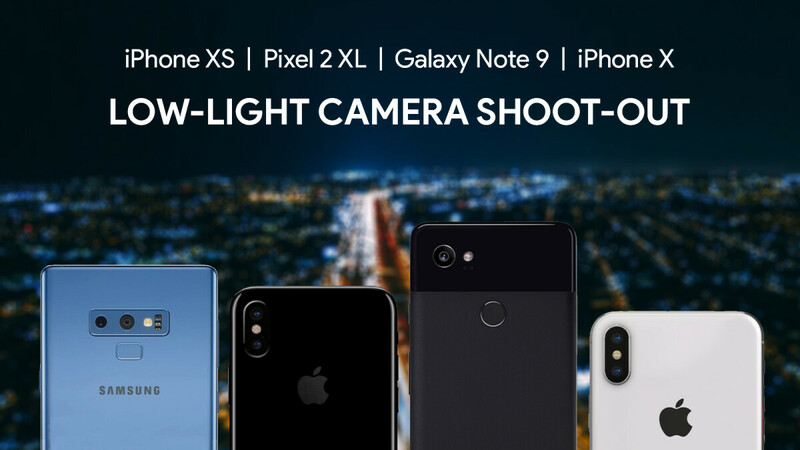 Starting from worst to best: it's a total blowout on the iPhone X, with a huge halo around the light; the Galaxy Note 9 fares a bit better, although the Pixel 2 XL manages the flaring even better; the iPhone XS is definitely the tightest of the bunch with almost no halo around the light, yet everything else in frame is sufficiently bright. The Pixel 2 XL does an alright job at handling the flare, though it does so at the expense of the overall exposure of the image. You'll notice that the Pixel has substantially underexposed the scene to compensate for the bright light, whereas the iPhone XS has both mitigated the flare and kept everything else sufficiently bright. This scene is similar to the one before, though with a more involved background this time around. All four phones do a commendable job at managing the bright streetlight and the darker backdrop, though the iPhone XS may be a step ahead of the pack when we zoom in. The Galaxy Note 9 also does a great job, though a closer examination of the café in the back reveals traces of Samsung's trademark noise-reduction and image-smoothing techniques. The result doesn't look bad, but compared to the iPhone XS, it is a little softer, though it's also a tad brighter as well. The Pixel 2 XL does a fine job at rendering the colors in this scene — better than the rest — but it's not so good at resolving details in the darker areas of the image. The iPhone X produces similar colors to the XS, though it blows out the light in the foreground and doesn't do as good of a job at pulling out details from the shadows in the back. This is where things get hard. Just looking at these photos, you'd think that there was a lot more light in this alleyway than there actually was. This speaks volumes about how capable the cameras of these phones are, though some have done a better job than others. Examining the results up close, it becomes evident that all phones struggled with this scene. Considering the poor lighting conditions, the amount of noise reduction that had to have been applied to this images must have been crazy. This is evident from the "painterly" effect present in all images. However, the Galaxy Note 9 and the iPhone XS manage to be a step ahead of the rest. The iPhone XS produces a more evenly-exposed result, with the brightly lit area in the center preserved quite well. The Note 9 also does a good job at preserving detail in the center area, though it goes way overboard on the yellow color of the light, which is actually much closer to orange. The iPhone X struggles quite a bit with the dynamic range of this scene. It's obviously decided to favor exposing for the shadows, which has left the well-lit central portion of the photo blown out. The Pixel 2 XL fares better in this regard, though the amount of noise reduction at play here is so over the top, that detail in the shadows has suffered greatly. The iPhone XS, iPhone X, and Galaxy Note 9 do an alright job here, with the main differences being in color rendering and exposure, but the Pixel 2 XL once again struggles to produce a usable result. The amount of noise in the Pixel 2 photo, especially considering how much noise suppression the phone throws in to mask it, is simply unacceptable. Just looking at the shots from this scene, do you notice a pattern here? Namely, that the Pixel 2 XL just doesn't seem to fare well in really, really dark environments? Because this seems to be the case. The brightest, sharpest shot here is courtesy of the Samsung Galaxy Note 9. The iPhone XS comes in second with an alright result, albeit a bit too dark. The iPhone X and the Pixel 2 XL both produce terrible results, though at least the iPhone manages to be brighter, if that's' of any consolation. This time around, we have a scene that has some bright light sources in it. Unfortunately for the Pixel, and it is evident right off the bat, it just doesn't do a great job here. The iPhone XS and the Galaxy Note 9 are well ahead of the pack, though the Samsung produces a better-exposed result (albeit not very color-accurate). The iPhone XS does a good job at rendering the colors in the scene and the result is actually very true to what I saw at that moment. The iPhone X and the Google Pixel 2 XL, on the other hand, leave us with blurry, noisy photos that are not appealing to look at. Though, to the Pixel's credit, it's managed to pull out some detail out of the neon signs, whereas the iPhone X has completely blown them out. And now it's time to move indoors. With enough artificial light in the bar, all four phones manage to produce usable results, though the patterns established in previous scenes continue here. The iPhone XS again impresses with its ability to suppress halos around bright light sources, while the Galaxy Note 9 demonstrates very good sharpness. However, the Note 9 once again is a bit off when it comes to color rendering, with some rather strong pink tint across the image. As we've already seen, the iPhone XS is a great camera to have with you during the day. It's also a marked improvement over the iPhone X when it comes to low-light photography, but it's still not quite up to par with the Galaxy Note 9 in some regards. Color rendering is one of the strongest suits of iPhones, and the XS is no exception. Colors remain natural and true to life even in less than optimal lighting scenarios. On the other hand, the Galaxy Note 9 is capable of pulling out detail from extremely dark shadows and delivering crisp results with close to zero noise. The Note 9, in true Samsung fashion, is not as accurate when in its auto white balance assessments as the iPhones, but it is truly a great phone for shooting pictures at night. The Pixel 2 XL is capable of managing complex lighting scenarios with deep shadows and bright lights. It's a phone that's consistently capable of retrieving even the faintest details in blinding neon signs while keeping everything else properly exposed, as we've seen in previous comparisons. The Pixel's downfall is truly dark environments where it just can't find anything to latch on. It's also experiencing some troubles with its autofocus when shooting in very dimly lit areas. It's always been Apple. Do you need to ask. Apple is a the top hype and propaganda company around. lol at the pace youre going on the forums, im putting my money on you to topple Apple in that respect. Nice trolling. Iphone cameras are the best when it comes to that. Your note saturates and lighted most of the time. Excluding the Huawei p20 pro from a low light camera test in itself is a photographing and digital sacrilege. "Huawei is prohibited in the US" No they are not, they are just not stocked at any of the major carriers. You can buy them in plently of other places in the US. But there are many posts about p20 pro on this website. It is only iphone marketing campaign post. Wow note 9 wins all of these from what I’ve seen. So much sharper then the rest. Where is the honesty in journalism these days? This place is fake news at its best. All they need now is to ban free speech that doesn't go along with their properganda or agenda. Samsung guys are retarded enough but your just strait up off your rocker. You didn't even manage to insult the correct person. Why not compare it with the Pixel 3XL? Surely one of you guys can find one by now? I find this article as a marketing campaign for the new iPhone and not for anything else. Why? 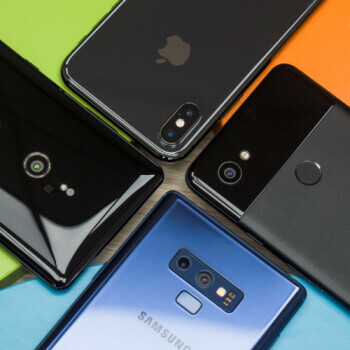 Because the author used two iPhones, the older and the new model instead of the P20 Pro or the XZ3. 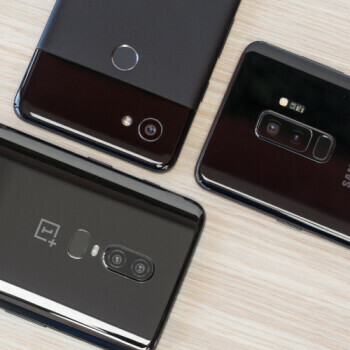 Could you please do a blind comparison between these devices and please exclude the iPhone X because we knew its camera is not on par with note 9, pixel 2/2XL and P20 Pro. There is no point of including it. Thanks in advance. 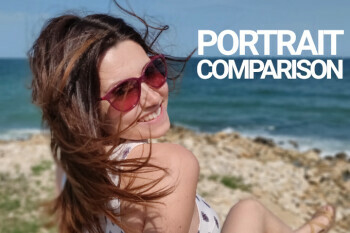 https://www.phonearena.com/news/iPhone-x-blind-camera-comparison-huawei-p20-pro-galaxy-s9-pixel-2-xl_id104510 Here's one i think, but i didnt read through the results. Mind sharing? Thanks for the link. However, I don't find it reliable because the author of that article has an inclination towards Apple. Just read all his articles here. I am just being honest, there are authors here that aren't inclined to a particular brand maybe they were the once suited to do an article. The result of a blind comparison will silence both camp of fanboys and will settle the argument of being biased against any phone maker. Nothing matters without a frame of reference. The authors will call victory for their sponsors and the fanbases for their camps. Without a proper, professional DSLR reference, this will never be a decent comparison. I don't see anything wrong to give Milen to review headphones, keyboards let's say and leave photography to experienced person. Whoever suits best for the task. Far enough I think. Put on your glasses The xs and the note 9 both did good but, the Pixel did surprise me, it pretty much sucked.